We need sincere politicians who do not come to politics to make money to think logically and manage the country’s affairs but unfortunately we have many unscrupulous persons elected to the parliament in whom you cannot place any trust. Yes. It is better than NOT passing. Undoing the errors of the past will take some time, but need to keep hacking at it. See how long it took England, with Magna Carta and the many changes that took place along the way. Magna Carta (Latin for “the Great Charter”), also called Magna Carta Libertatum (Latin for “the Great Charter of the Liberties”), is a charter agreed by King John of England at Runnymede, near Windsor, on 15 June 1215. [a] First drafted by the Archbishop of Canterbury to make peace between the unpopular King and a group of rebel barons, it promised the protection of church rights, protection for the barons from illegal imprisonment, access to swift justice, and limitations on feudal payments to the Crown, to be implemented through a council of 25 barons. Neither side stood behind their commitments, and the charter was annulled by Pope Innocent III, leading to the First Barons’ War. After John’s death, the regency government of his young son, Henry III, reissued the document in 1216, stripped of some of its more radical content, in an unsuccessful bid to build political support for their cause. At the end of the war in 1217, it formed part of the peace treaty agreed at Lambeth, where the document acquired the name Magna Carta, to distinguish it from the smaller Charter of the Forest which was issued at the same time. Short of funds, Henry reissued the charter again in 1225 in exchange for a grant of new taxes; his son, Edward I, repeated the exercise in 1297, this time confirming it as part of England’s statute law. The charter became part of English political life and was typically renewed by each monarch in turn, although as time went by and the fledgling English Parliament passed new laws, it lost some of its practical significance. At the end of the 16th century there was an upsurge in interest in Magna Carta. Lawyers and historians at the time believed that there was an ancient English constitution, going back to the days of the Anglo-Saxons, that protected individual English freedoms. They argued that the Norman invasion of 1066 had overthrown these rights, and that Magna Carta had been a popular attempt to restore them, making the charter an essential foundation for the contemporary powers of Parliament and legal principles such as habeas corpus. Although this historical account was badly flawed, jurists such as Sir Edward Coke used Magna Carta extensively in the early 17th century, arguing against the divine right of kings propounded by the Stuart monarchs. Both James I and his son Charles I attempted to suppress the discussion of Magna Carta, until the issue was curtailed by the English Civil War of the 1640s and the execution of Charles. The political myth of Magna Carta and its protection of ancient personal liberties persisted after the Glorious Revolution of 1688 until well into the 19th century. It influenced the early American colonists in the Thirteen Colonies and the formation of the American Constitution in 1789, which became the supreme law of the land in the new republic of the United States. Research by Victorian historians showed that the original 1215 charter had concerned the medieval relationship between the monarch and the barons, rather than the rights of ordinary people, but the charter remained a powerful, iconic document, even after almost all of its content was repealed from the statute books in the 19th and 20th centuries. Magna Carta still forms an important symbol of liberty today, often cited by politicians and campaigners, and is held in great respect by the British and American legal communities, Lord Denning describing it as “the greatest constitutional document of all times – the foundation of the freedom of the individual against the arbitrary authority of the despot”. In the 21st century, four exemplifications of the original 1215 charter remain in existence, held by the British Library and the cathedrals of Lincoln and Salisbury. There are also a handful of the subsequent charters in public and private ownership, including copies of the 1297 charter in both the United States and Australia. The original charters were written on vellum sheets using quill pens, in a particular style of abbreviated Latin. Each was sealed with the royal great seal using beeswax and resin, most of which have not survived. Although academics refer to the 63 numbered “clauses” of Magna Carta, this is a modern system of numbering, introduced by Sir William Blackstone in 1759; the original charter formed a single, long unbroken text. The four original 1215 charters were displayed together at the British Library for one day, 3 February 2015, to mark the 800th anniversary of Magna Carta. From what I gather, the tradition of promise to abolish the executive presidency by winning candidates and continue to keep it later,since 1995 may take place once again. Seems My3 is position and surrounding himself with people who are in favour of executive presidency. Hope I am wrong. So, it is now or never. Yes, all signs point to a radically different president. I hope the signs will lead us on the righteous path to the right destination. The 19th amendment will also keep the president on the right and wise oath- hopefully! We deserve this break and should not permit the opportunity this provides to be scuttled by the pack of jackals braying all around us and amidst us. They are waiting to go for the kill. I want our President Sirisena to take the lead and solve our problems. We are reading more from PM Ranil than the President. During Rajapakser’s reign we hardly heard anything from the PM!! According to my assessment the President should have the power to dissolve Parliament in case of an instability and lack of majority. No elected member will vote for a dissolution in such a situation and the instability will continue for four years until the President intervens as per the amendment suggested. No doubt we want Republic Constitutional to be reform and reorder path and model of Capitalism progress in Island. Like it or not that lack of political leadership vision of MS UNP-Ranil. W.. and CBK , hence that unmet demands of emerging new social class in our society has to be reflected and address by proposed Constitution. Are there NO any such move by any quarter of Thinking thanks of elites groups OR by ongoing political leadership has lost such political mission? self-interested policies on Republic reorder of constitutional changes. Needless to say since War had ended 2009 May with an agreement on the restoration of Democracy and Sovereignty not yet upheld. Result of war tone democracy had been that sever damage by LTTE RUTHLESS TAMIL TERRORIST ,which balance of democracy power want to be Territorial adjustments. Once we have achieve stability, security and peace after war ,we as nation in progress towards real Independence, Sovereignty and National unity then is suitable time for change constitution. We as nation have not reached such new reality on deliberation up to NOW. All social class and forces working without any political agenda. After 2015 January election that created political instability by foreign interference Indian- RAW, that BJP-RSS agenda , US and UK have undermine stability and democratic disorder, through out an Island. The concept of democracy on Republic ,for our nation defined by ethnic and linguistic unity, has to be a proper address by Sri lanka state. In fact ensure of democracy we have to be assessed ,and that majority people express their underlying will towards National harmony and unity is important. Is it RIGHT? Is it JUST? Is it in the interest of PEOPLE OF SRI LANKA? Well Said Jehan, I hope all these liberals and other assorted idiots screaming for lightning fast change and prosecution without due respect for the processes involved, read this article. I have read your article and take issue with some of your assertions. 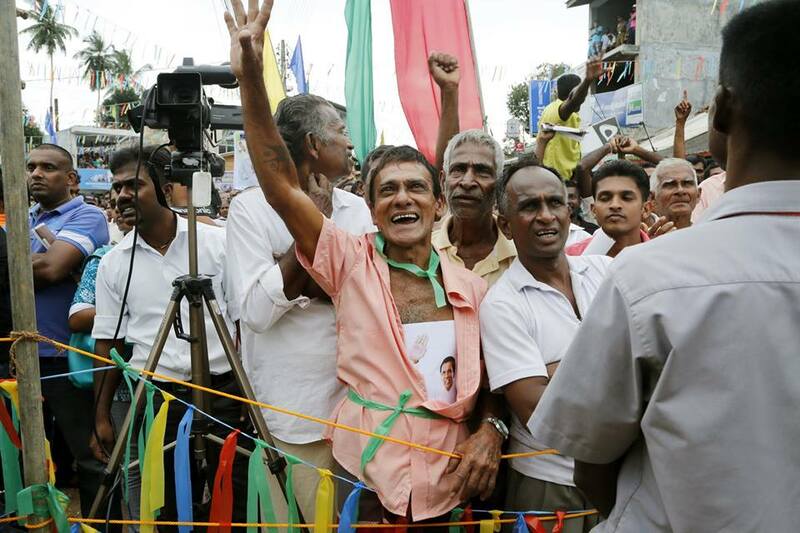 1) The opposition parties, including a substantial section within the SLFP itself, are of the view that the military victory secured over the LTTE was only possible because of the strong government that existed in the last phase of the war, of which the presidency was the cornerstone. *** I disagree with you that it was the strong Presidency that won the war. It was a combination of willingness on the part of the War Criminal MR to kill and the signal and the help from traitor India which secured the victory. There was a time India refused to even accept a casualty figure of 10,000. But post Rajivs killing and the Crowning of the Italian witch changed the fortunes and the Tamils paid a heavy price. Just imagine if Mrs.Gandhi was in power and whether she would have accepted a carnage of 150,000. Certainly not. Without Indias nod even MR wouldn’t have been able to butcher so many. 2) I agree with you on the fact that MS appears to be Genuine in wanting to solve the Ethnic Issue. But he is up against centuries old hatred by the Majority towards the Minority. That is why MR is trying to rear his ugly head and that is why I have always maintained that the solution to the Etnic Problem is going to come from within. In my view this is how things are going to develop. 1)MS & RW are not going to devolve power to the extent to satisfy the Tamil aspirations as the consequences of doing so unimaginable and that is why both are dilly dallying. Give a little here and give a little there. 2) First and foremost MR should be taken out of the equation in Sri Lankan Politics to douse the flame of Sinhalamisation ( which appeals to Majority Sinhalese ) and that will happen in September when the long awaited UNHCR reported is published making MR UNTOUCHABLE. 3) Sinhala Lanka will then be faced with the situation COMPLY or DIE. The writer is canvasing for the transfer of powers from the President to an unelected minority Prime Minister without a shame. Mind you this prime minister can continue to be hold power without time limits. What a contrast. It is bad for the president to continue more than two terms with the blessing of the people, but it does not apply to a appointed prime minister. The first principles of good governess is shattered when My3 appointed Ranil to be the PM without forcing an election in the house in Ranil’s style. Then he himself took over the SLFP presidency through a obscure clause in its constitution where party leadership will be held by Highest ranking government officer even it is bestowed by the opposition. He should have faced an election of the office bearers of SLFP in the tradition of democracy before holding that office. Ranil is better in that regard as he has got the party constitution amended for him to be the leader for life. After 30 odd defeats he is still the party leader in good governess and democratic style. The lopsided west has nothing to say this undemocratic process. Where is Pakyasothi Sarawanamuttu to high light these lapses. Very nice act of NGO.